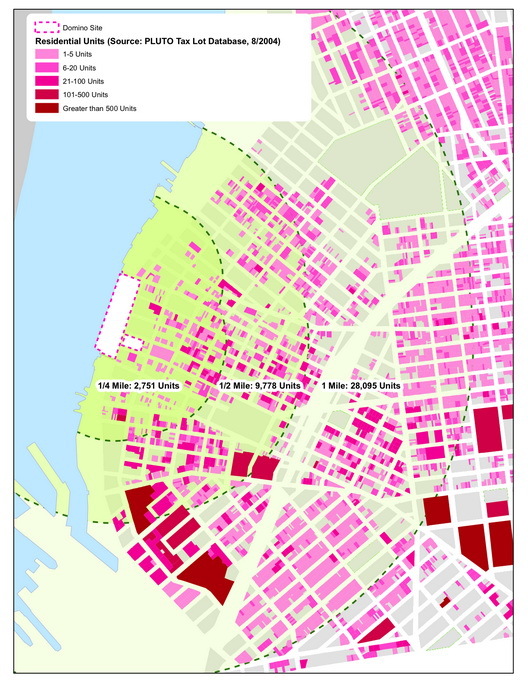 To get a sense of how much housing and how many people the New Domino project would add to Williamsburg, simply look at the map above. It comes from a post on Wild Green Yonder by Adam Brock. We reproduce it here, because it shows the impact in a graphic way. Simply put, New Domino would double the population of the neighborhood within a quarter-mile radius. The Domino development--which would be in the white rectangular shape on the waterfront--would have about 2,400 units of housing, mostly in towers up to 30-40 stories tall. The first ring in the map, which still has a lot of industrial properties, currently has 2,751 units of housing. The second ring totals 9,778 units. And the third ring out brings the overall total to 28,095 units. So, even viewed in the context of the bigger one-mile radius, Domino would boost population by nearly 10 percent. We only related this in order to show that New Domino would be a significant development with a major impact on schools, police & fire protection and transportation. the only thing is that by the time anything actually gets built there, there will already be over 2000 new units on the waterfront just above it. And don't forget all of the properties on the Williamsburg waterfront that, although technically zoned commercial, are actually being used as residences. This is NOT going to happen. If any of you realize, the housing bust is taking away working capital from investors and developers alike. Also, since most of those units were the "luxury" kind (think jumbo mortgages over 400K) that money has since dried out and banks and others aren't funding those mortgages. I'd be surprised if Northside Piers ever gets more than 50% occupied. Look at Shafer Landing, they still have some vacancy issues and when the "jumbo" ARM's reset in '08 you can forget about all those condos being sold. They will most likely be acutioned off or turned into rentals. Yeah, but we NEED housing. As much fun as it is to whine about how crowded the L train is, without apartment construction the last few non-ultra-rich folks hanging out in North Brooklyn are going to find ourselves living in South Philly somewhere.